Ground beef and pinto beans team up in this tasty dish. It's a quick and easy bean dish that will satisfy any hungry family, with or without the rice. Diced fresh vegetables make it an excellent solution for picky kids because the vegetables "hide" in the tasty beef and bean mixture. Mild chilies are included in the dish; add a minced jalapeño to the mixture if you like some heat in your pinto beans. In the South, cornbread is an essential bread to serve with beans, but crusty bread, tortillas, or biscuits are all good choices as well. The dish is versatile as well. Feel free to lighten the dish a bit with ground turkey instead of beef. Or add an extra 1/2 pound of ground beef or ground sausage for meatier beans. The diced carrots add a bit of natural sweetness to the mixture; if you aren't a fan, omit them or replace them with 1/2 cup of sliced celery. The main seasoning for the dish is chili powder; if you prefer a different flavor profile, consider Cajun or Creole seasoning or a basic seasoned salt blend. Heat the olive oil in a large deep skillet or Dutch oven over medium heat. When the oil is hot and shimmering, add the ground beef, onion, and carrot to the skillet. Break the beef up with a spatula or wooden spoon. Cook the beef mixture until meat is no longer pink, stirring frequently. Drain off excess drippings. Add the bell pepper, tomatoes, tomato paste, chopped green chilies, pinto beans, and seasonings. Bring the mixture to a simmer; reduce heat, cover, and continue simmering over low heat for 20 to 25 minutes. Meanwhile, cook 1 1/2 cups of rice following the package directions. When the rice is ready, fluff it and keep it warm. 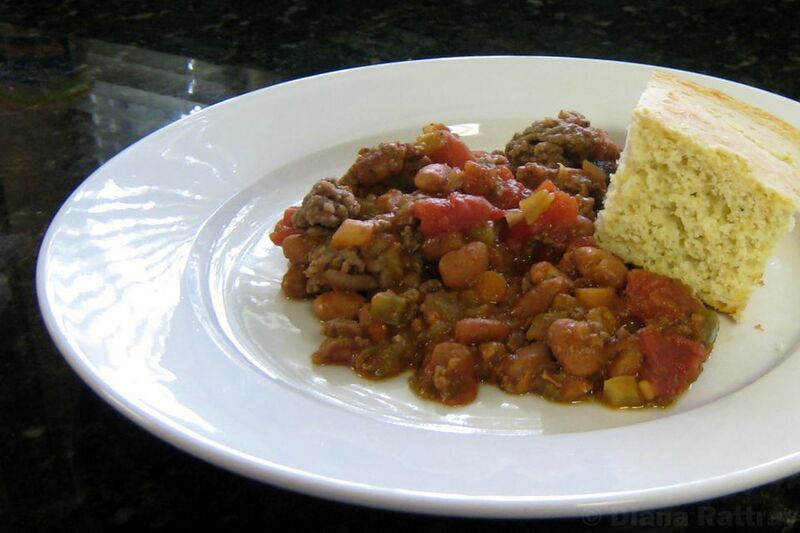 Serve the beans with the rice and a tossed green salad along with cornbread wedges or cornbread muffins. When fats are drained and discarded, don't pour them down the sink. Fats can clog pipes and result in costly plumbing problems. Keep an empty jar nearby. When the jar is full, put the lid on it and dispose of the fats in the trash.